All characters are written like this: Guybrush Threepwood. All items are written like this: Rubber chicken. There are a few exceptions to the rules above. If a conversation is being quoted and a name comes up, it will not stand out. Also, items only stand out when you can pick them up or use them for something. When you are done talking with the lookout, Part I will begin. Go into the Scumm Bar and talk to the pirate by the window, Mancomb Seepgood. Talk to him and say you want to be a pirate. Then ask where you can find the governor. He will tell you a story and suggest you ask Estevan to tell you the rest of the story. Go and talk to the pirate directly under the chandelier, Estevan. Ask him about the LeChuck guy. You can also talk to the pirate sitting beside the dog, but he's not important. You can also talk to the dog for fun. Go to the right past the curtain and you will find the important-looking pirates. Talk to them and tell them you want to be a pirate. They will explain that you have to go through "The three trials" to become a pirate. They are mastering the sword, mastering the art of thievery, and the quest, which is finding the lost treasure of Melee Island. They request you return with proof that each time you have accomplished one of the trials. You can now ask them to tell you more about each of the trials or you can end the conversation. Try and open the door to the right. The cook will tell you to get lost. Wait until he leaves the kitchen and has walked out of the screen. Then enter the kitchen. Pick up the hunk of meat on the table and the pot from under the table. Use the hunk of meat with the pot o� stew in the corner. Then pick it up again. Its now stewed meat. Open the door to the small bridge. A seagull will land and start eating the fish. Go out to the end of the bridge, the plank will flap and scare the seagull away. Do this a few times and quickly pick up the fish. Wall back out of the kitchen and return to the street. When you leave the Scumm Bar and cutscene follows with Bob telling LeChuck that there is a problem on Melee Island with a new wannabe pirate.After the cutscene, walk to the left, back up to the lookout and past him to the right.Now you see a map of Melee Island with lights. They represent places you can go. Go to the one in the middle called "clearing". Youll see that it is a circus. Walk inside. You will see the two Fettucini brothers arguing. Wait until they are done, then say something to get their attention. They will immediately try to convince you to test the cannon for them. Agree to the deal, you will discover that they will pay you 478 pieces of eight. They will ask you if you have a helmet, say of course and show them the pot. Guybrush will be shot out of the cannon and land with his head down. Say something to assure them you are ok. You get paid. Leave the tent and go back onto the map. Go back to the town and past the Scumm Bar. You will see a guy, with a parrot on his shoulder, standing on the corner. He is called citizen of Melee. Go over and talk to him. 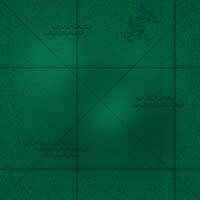 He sells a map to the legendary lost treasure of Melee Island for only 100 pieces of eight. Buy it. Look at it. It looks like you been cheated, but you just have to learn to read it right. We will get back to it. Walk to the left and you will see three men and a rat, the Men of Low Moral Fiber. Run the mouse cursor over the rat until it runs away. Talk to the men and say you are sorry about the rat and that you love rats. They will then tell you an important story. Talk to them some more, you even get them to give you two pieces of eight if you take one of their minutes from the last Melee Island PTA meeting, but it is no use. Enter the first door on the right hand. Pick up the chicken from the trunk, its a rubber chicken with a pulley in the middle. Go to the right and meet the voodoo lady. Talk with her about everything. When you are done talking with her, leave her house and continue through the archway. You will hear someone saying "Psssst" from the alley. Walk into the alley. Here you will meet Fester Shinetop. Talk to him and leave the alley when you are done. Enter the right door. It leads into the shop. When you enter the shopkeeper will start talking to you. (If hes not there, ring the bell and he will come.) Go up the stairs and pick up the shovel next to the safe. Go down again and pick up the sword lying on top of the red chest. Go talk to the shopkeeper and tell him you wish to buy the shovel and the sword. Don't ask him who you can test the sword on, we'll get back to that later. Leave the shop. Go back up to the top of the cliff and onto the map. Go to the place named "house", its the area farthest to the right. You will be stopped at a bridge, where a troll wont let you pass. Talk with him and then give him the fish. He will then let you pass. (Notice him eating it.) Press the area called "house" again. When you get there you will see a house. You can read the sign if you want, it is Captain Smirks house and he takes 30 pieces o� eight for a sword-training lesson. Open the door to the house. (Guybrush will knock). Captain Smirk will greet you. Talk with him and get him to train you. During this conversation youll also hear about Carla, the Sword Master. When he agrees to train Guybrush they go inside his house. Youll see a cutscene of Guybrush getting trained. (You have to choose a few lines of speech during the cutscene.) Now youre trained in sword fighting! Well, almost. Now you have to learn some insults so you can beat Carla, the Sword Master, and complete one of the three trials. Go back onto the map. Now you will see a lot of other dots running around on the map. Those are other pirates and you have to fight them to learn insults and comeback. Stand still somewhere on the map until another pirate walks into you. 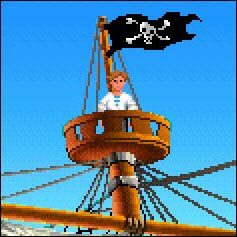 The picture will change and you will see Guybrush and the pirate standing a few feet from each other. Tell him he should prepare to die. The sword fight will begin. The pirate will say and insult and you have to respond. You probably wont win the first few times, but you will learn some insults and comeback. Keep doing this with other pirate also until one of them says "Wow! Youre good enough to fight the Sword Master." (If you need help with the insults and comebacks, see the insults at the end of this page) Now you are ready to fight the Sword Master! But first you need to find her. Go back to the shop and talk to the storekeeper. (If hes not there, ring the bell on the counter.) Say, "Im looking for the Sword Master of Melee Island". The storekeeper agrees to hike all the way over to the Sword Master and ask her if he can show you her hideout. As soon as he has left the shop, follow him! Open the door and go outside. Youll see him walking away, follow him. When you get to the map, the storekeeper is the only dot on the map, follow him into the fork. Once inside the fork, keep following him and youll soon find the Sword Master. After the storekeeper has left, approach her and talk to her. Soon youll be in a fight with her. Now you have to fight her like you fought the pirates, but she uses other insults so you have to find a comeback that matches it. (If you need help with the insults and comebacks, see the insults at the end of this page) When you win shell give you a T-shirt as prove. Now you have completed one of the three trials. You can go back to the Scumm Bar and tell it the important-looking-pirates, but its not necessary. Go back into the forest. Choose one of the roads. No matter which you choose youll end up near some yellow flowers. Pick some of them. Now you need to find the buried treasure, and to do that you need the map you bought from the citizen of Melee. First go back to the first "room" of the forest. Look at the map. If it for instance says "Back! Two-Three-Four!! Just ignore the "Two-Three-Four!" You only need to worry about the first word. Left is, of course, left and right is right. Back is, on the other hand, up. Now, just follow the map and youll soon be at a part of the forest that looks a bit different than the rest. Walk to the right of the screen. Aha! Theres the X. Use the shovel on the X. Youll see a cutscene of Guybrush digging and finding another T-shirt to prove he has found the legendary lost treasure of Melee Island. Again you can show it to the important-looking-pirates if you want to. Walk back to the town and past the shop to the mansion. Now you have to steal the Idol of Many Hands. There are some dogs blocking your way. Use the yellow petal with the stewed meat with the stewed meat. Now youve got meat with condiment. Give it to the dogs and theyll fall asleep. Open the door and go inside. Now you are inside Governor Marleys mansion. Open the door next to the vase and go in. Fester Shinetop will appear. He tries to arrest you and theres a big fight. You escape and Fester Shinetop is trapped. As you realized during the fight, you need a file to open the lock to the Idol of Many Hands. behind. After your talk with governor Marley, Go outside again. Fester Shinetop catches you, steal your sword and throws in the sea with the idol tied to your leg. Now you need to get up. Pick up the idol. Guybrush will pick up a sword and climb up. When you get up youll see a ghost ship sailing away. The lookout will appear. When you talk to him youll learn that LeChuck has kidnapped Governor Elaine Marley and sailed back to his hideout on Monkey Island. Youll also get a note from LeChuck. Now you need to get a ship and gather a crew of three people, but first go into the Scumm Bar and youll find the cook crying at the table where the important-looking-pirates were. Talk to him about everything. When you leave, pick up all the mugs you can find. (There are five of them). First well get a ship. Go to the map and select the biggest sop of lights there is. "Its called "lights". Here you will be greeted by Stan. Hell show you some ships. See the one thats half-sunken? Thats the one we want. Get him to show you a ship and then say, "Actually, I was hoping to get one on credit". Hell tell you he doesnt give credit, but if you had a job the storekeeper might give you credit. Leave and go to talk to the storekeeper. (Stan gives you a compass when you leave). Tell the storekeeper you want some credit, then lie and say youve got a job. Hell go get a note from the safe. Notice the combination he uses. Hell then ask for what kind of job you have and you have to confess and say you dont have a job. The storekeeper will put the note back in the safe. That gives you another chance to see the combination. When he gets back, tell him you are looking for the Sword Master. Hell hike all the way over to her again and you are alone in the store. Go up and open the safe with the combination. (Push, pull the lever). Get the note you now have a note of 5000 pieces of eight. Go back to Stan. Tell him you havent got much to spend. Hell show you the ship we want. Then tell him youve got a note from the storekeeper. Stan wants 10000 pieces of eight for it, but youve only got 5000, so you need to bargain. Get him to talk about extras and say, "I think I can live without that particular piece of junk" to everything he says. Do that a while and then say "Enough about extras, already" and ask him what he thinks its worth. If the price is 7300, tell him you dont want the ship anyway. He calls you back and he now think its worth 6300 pieces of eight. Make him an offer of 5000 pieces of eight. Hell take it and youve got a ship. Stan will meet you at the dock with the ship when youve got a crew. Now you have to get 3 crewmembers. They are The Sword Master, Otis (the prisoner), and Meathook (You havent meet him yet). Lets start with the Sword Master. Go and visit her again. (You dont have to go through the forest again, you can just click on the dot named "Sword Masters" on the map. Talk to her and tell her the governor has been kidnapped. Shell join your crew. Go back to the map. Youll see a cut-scene of LeChucks ship and youll realize that Fester Shinetop is actually LeChuck. Back on the map choose the dot to the north-east named "island". When you get there youll see Hook Island. To get there, use the rubber chicken with the cable. Open the door to the house and go in. Here you will meet Meathook. Tell him the governor has been kidnapped, and that you are gathering a crew to go after her. Hell agree to you being the captain on one condition: You prove your courage by touching the winged devil! Open the small door and see a parrot! Just touch and Meathook is a member of your crew. After the cut-scene, where you discover that your crew is rather lazy, you start in the captains cabin. Open the drawer, look in it and Guybrush will pick up an old book. Its the captains log. If you read it you will learn how a Captain and a Mr. Toothrot mysteriously ended up on Monkey Island and youll discover that they used the top of a cereal box as a bookmark. Pick up the feathered pen and then the ink from the desk. Leave the room and crawl up the rope ladder. When you are at the top pick up the jolly roger, crawl back down and go down the hatch. Now you see a door and another hatch. Crawl down through the next hatch. Down in the storage room, pick up the giant piece of rope. Open the red chest and look in it. (Guybrush will pick up some fine wine.) Now open the kegs in the left side of the room (Guybrush will pick some gunpowder). Crawl back up through the hatch and enter the door. You are now in the kitchen. Pick up the pot from the table and open the cabin on the left. Pick up a cereal box and open it. You will find a toy price inside it, look at it, its a key! Go back to the captains cabin and use the key in the cabinet. Theres a chest inside, pick it up. (Guybrush will put in one the floor). Open it and look in it. Guybrush pick up a piece of paper and some cinnamon sticks. Look at the paper, its a recipe for a voodoo spell that will guide you to Monkey Island. Go back down to the kitchen. These are the things you need to put in the cooking pot: Cinnamon sticks, fine wine, jolly roger, gunpowder, ink, breath mints, the rubber chicken, and the cereal. That will create the voodoo spell that will take you to Monkey Island. Here is a list of things that you also can put in the cooking pot, they wont make a difference, but youll clear up your inventory list. Remember to add them before you add the last item of the real recipe: Minutes, 100% Cotton T-shirt, T-shirt, staple remover, note, business card, dusty book, bookmark, feather pen, small key, and the piece of paper. After the cut-scene Guybrush is asleep on the floor. Press somewhere on the screen and he will wake up. 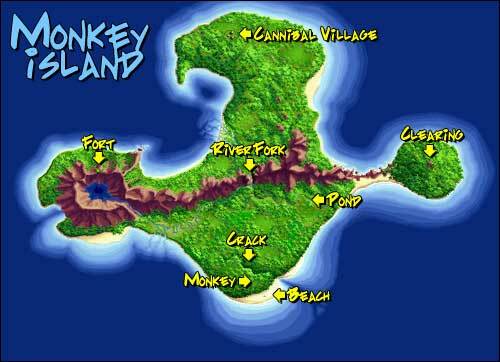 Go u on deck, youll see that you have found Monkey Island. Now you need to get over there. Remember the cannon trick at the circus? You have to do that again, so go down to the storage room and pick up some more gunpowder. Go back up and use the gunpowder in the cannons nozzle then use the giant piece of rope in the back of the cannon. Go down to the kitchen and use the map (or a T-shirt if you didnt throw it in the pot) in the fire under the pot. You will get a flaming mass. Go back up to the deck. Now light the fuse with the flaming mass and quickly use the pot. Guybrush will put on the pot and crawl in the cannon and get shot out. If youre not fast enough and the cannon fires without Guybrush, just get some more gunpowder and try again. Youll find Guybrush lying on the beach with his *ss on fire. Herman Toothrot present himself and welcomes Guybrush. Since hes just lying there, Herman leaves again. Press anywhere on the screen and Guybrush will get up. Pick up the banana next to the tree and read the note on the tree. Go into the jungle. Youll see the map of the island. 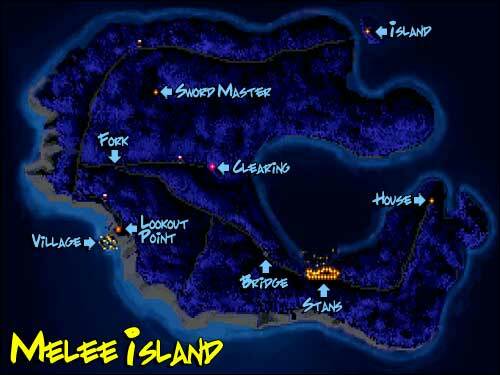 Monkey Island is so big that the entire map cant fit on one screen, so walk to the upper left corner and proceed to the next screen. Now go to the fort. This can be difficult to find so you can look at the picture below and see where it is. Pick up the rope and the spyglass. Push the cannon, some gunpowder and a cannonball will fall out. Herman will show up. Talk to him. Pick up the gunpowder and the cannonball when he leaves. Leave the fort and go to the right on the map. Go to the spot called "river fork". Theres a note with a rock on top of it. Pick up both things and read the note. Look at the rock, its a piece of flint. Cross the bridge and crawl up the footholds. Youll find some primitive art (a catapult) and a note. Read the note. Go up the next set of footholds. Go down to the catapult. Push or pull a few times and use the spyglass to check with direction it is pointing. When Guybrush says he can see the banana tree it is ready. Go back up the footholds and push the rock sitting at the edge of the cliff. If you don�t hit the tree (or want to sink your ship) go down and adjust the catapult, go back up and pick up a new rock from the pile (Guybrush will automatically place on the edge of the cliff. Go all the way back down to the bridge. Cross the bridge to the dam. Use the gunpowder with the dam. Now use the piece of flint with the cannonball. It will blow a hole in the dam and flood the blocked river. Now go to the place named "pond". Read the note. Herman will show up again. Talk to him. Pick up the rope from under the unhealthy looking man. Enter the map and go down, on the next screen go to the beach. Go to the left and pick up the two bananas on the beach. Go into the jungle again and select the place called "crack". Here you need the two ropes to get down to the oars. Use one rope on the branch. Climb down it and use the other rope on the sturdy stump. Crawl down and pick up the oars and climb back up to the map. Go back to the beach. Use the oars with the rowboat. Now you see it from above again. Row up to the right, then row around the peninsula and continue up, finally dock at the beach. Herman once again join you. Talk to him. Read the note. Enter the jungle and select the spot named "village". You are now in the Cannibals� village. Go to the left. Pick up the bananas from the bowl of fruit. Now go to the right, the Cannibals will catch you. Talk to them. You�ll end up trapped in their guest hut. Read the memo. Under the window is Herman�s banana picker, but just leave it there for now. Pick up the skull from the floor and open the loose board underneath. Crawl down the hole. You�ll escape while the Cannibals are talking. Now go to the beach and row back to the other beach. Go into the jungle and go to the monkey. (A little gray spot running around). Give the five bananas to it. It will now follow you. Go into the jungle again. Go up to the next screen of the map and to the right to next screen, select the spot named "clearing". (See the monkey following you?) Go to the right until you reach the fence surrounding the Great Monkey Head. Pull the middle nose on the totem pole. The gate opens, but when you let go of the nose to enter, it closes again. The monkey sees this and helps you by pulling the nose. Enter the gate. There are a lot of idols in front of the Great Monkey Head. Pick the little one called "wimpy little idol". Now go all the way back to the beach and row back to the Cannibals� village. Go from the entrance to the hut where you were trapped and go back towards the entrance again. Now the Cannibals are there. Say, "Don�t eat me! I�ll give you anything!" When they want item to spare your life, give them the wimpy little idol. They are grateful and leave. Now the hut is open so enter it. Pick up the banana picker and leave. Go to the right and you�ll meet Herman. Talk to him and say, "I have your banana picker". Guybrush will give it to him and in return Herman will give Guybrush the monkey head key. Now walk and row all the way back to the Great Monkey Head. Use the monkey head key in the ear of the Monkey Head. The entrance will open. Go inside. Now go all the way to the right of the screen until you get to the next screen. It�s obvious you can�t find your way through this, so go back outside and row all the way back to the Cannibals. (There is a lot of rowing.) When you meet them say that there is a way they can repay him. When they ask how, say, "I�m looking for somebody". Then say "That�s okay. The people I�m looking for aren�t living." You learn from their talking that they normally makes a potion to get rid of the undead. Say "So why don�t you do that now?" You learn that the main ingredient is a rare root, which LeChuck has stolen. Say, "Where is he hiding it?" and then "Can�t you just go down there and kick him out?" and "I�m off to find LeChuck and get the root!" The Cannibals say you need something to find him, but they won�t tell you what. Ask, "Why are you guys talking in pig Latin?" 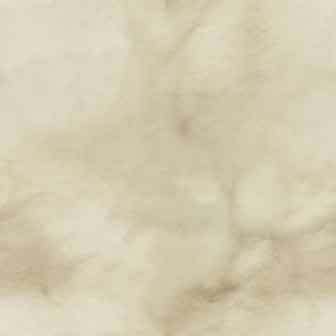 They explain that it�s a Navigators head, and you can�t find your way through the catacombs without it. When they start talking among them selves, give them the leaflet. It can help them get a new head, so they give you the Navigators head. They tell you that the necklace makes it invisible to ghost and that you should follow its nose and it will lead you to LeChuck. Now row and walk all the way back to the Great Monkey Head and go inside. Go all the way to the right until you get to the next screen. Now look at the Navigators head. Guybrush will say what way its nose is pointing, go in that direction. Keep doing this every time you get to a new screen. Eventually you will get to LeChuck�s ship. If Guybrush says he is confused, just wait a little while and look at it again. When you get to the ship, talk to the Navigators head. Keep begging for the necklace until he gives it to you. Then "use" the necklace (Guybrush will wear it). Now go onboard the ghost ship. Guybrush will be invisible. It�s a little weird at first, but you�ll get used to it. You�ll see some ghosts dancing and having fun. Go to the left and open the door. Go inside. Inside you�ll find LeChuck. Don�t move or he will see you. Instead, use the magnetic compass, you got from Stan, on the key on the wall. Leave the room and go past the dancing ghosts and down through the hatch. Down in the room you�ll find a sleeping ghost. Go through the next door. In the next room you�ll find some chickens, pigs and the root locked in a glowing crate. Pick up a chicken, which will get you a feather. Go back to the sleeping ghost and tickle his feet twice with the feather. He will drop a bottle of jug o�grog. Pick it up. Go back to the animals and use they key to unlock the hatch. Go down. Down there are some rats, a dish and a pot of cooking grease. Use the jug o�grog with the dish in front of the big rat. It will drink it and fall asleep. Pick up some of the cooking grease. Go back up to the deck and open the door next to the hatch. It squeaks. Use the glob of grease on the door and open it again. Go trough it. There is a ghost guarding the door to cell where Elaine is held prisoner. Pick up the ghost tools from the wall. Go back down to the glowing crate and use the ghost tools to open it. Look at it and Guybrush will automatically pick up the root. Walk back up and leave the ship and enter the cave again. (Guybrush will automatically go out of the cave and row back to the Cannibals). A cut-scene follows where Guybrush gives the root to the Cannibals and they leave to make a potion. You�ll then get the chance to talk to a three-headed monkey. After that the Cannibals return and give you the magic seltzer bottle. Leave the village. (Guybrush will automatically walk, row, and walk back to the ghost ship). But when he gets there he discovers that the ship has sailed. Only Bob is still there, because he dropped his head in the lava and the others wouldn�t wait for him. When you talk with him you learn that LeChuck has sailed back to Melee Island to marry Elaine. After that your crew shows up talk to them and you�ll sail back to Melee Island with them. (If you sank your boat with the catapult, Herman will show up and you�ll sail back to Melee Island with him). When you start you will be back at the dock on Melee Island. Go to the right, a ghost will stop you. Chose a comment from the list and Guybrush will spray him with the magic seltzer bottle. The ghost�s leg will run away. Go towards the church. On the corner you�ll meet grim spectre. Talk to him and select a comment, Guybrush will also spray him with the magic seltzer bottle. He will vanish. Go through the archway and enter the church. Inside you�ll find Elaine and LeChuck about to get married. Scream something and Guybrush will confront LeChuck. When you talk to him you�ll se Elaine lowering herself down behind LeChuck. Talk to Elaine and you�ll discover that it�s two monkeys wearing the wedding dress. The monkeys have a bottle of ghost-zapping root bear, but Guybrush scares them and Elaine chases after them. Talk some more with LeChuck. At some point he will hit Guybrush so he�ll go flying all over the island. When you land at "Stan�s used vessels" you will land in the grog machine, some money and some grog will land on the ground. Stan will show up, but LeChuck will quickly get rid of him. When LeChuck pulls you out of the grog machine, quickly pick up the root beer and use it on LeChuck. Now watch the end and have a nice conversation with Elaine. And I've got a little TIP for you, get the POINT? Soon you'll be wearing my sword like a shish kebab! First you better stop waiving it like a feather-duster. So you got that job as janitor, after all. I once owned a dog that was smarter then you. Nobody's ever drawn blood from me and nobody ever will. I got this scar on my face during a mighty struggle! I hope now you've learned to stop picking your nose. Have you stopped wearing diapers yet? Why, did you want to borrow one? I've heard you were a contemptible sneak. Too bad no one's ever heard of YOU at all. You're no match for my brains, you poor fool. I'd be in real trouble if you ever used them. You have the manners of a beggar. I wanted to make sure you'd feel comfortable with me. I'm not going to take your insolence sitting down! Your hemorrhoids are flaring up again, eh? There are no words for how disgusting you are. Yes there are. You just never learned them. I've spoken with apes more polite then you. I've got a long, sharp lesson for you you to learn today. And I've got a little TIP for you. Get the POINT? My tongue is sharper then any sword. First you better stop waving it like a feather-duster. My name is feared in every dirty corner of this island! My wisest enemies run away at the first sight of me! If your brother's like you, better to marry a pig. No one will ever catch ME fighting as badly as you do. I will milk every drop of blood from your body! My last fight ended with my hands covered with blood. I hope you have a boat ready for a quick escape. My sword is famous all over the Caribbean! I've got the courage and skill of a master swordsman! Every word you say to me is stupid. You are a pain in the backside, sir! There are no clever moves that can help you now. Now I know what filth and stupidity really are. I usually see people like you passed-out on tavern floors. This walkthrough is written by Ken Christensen, and modified by Jabbamonkey.